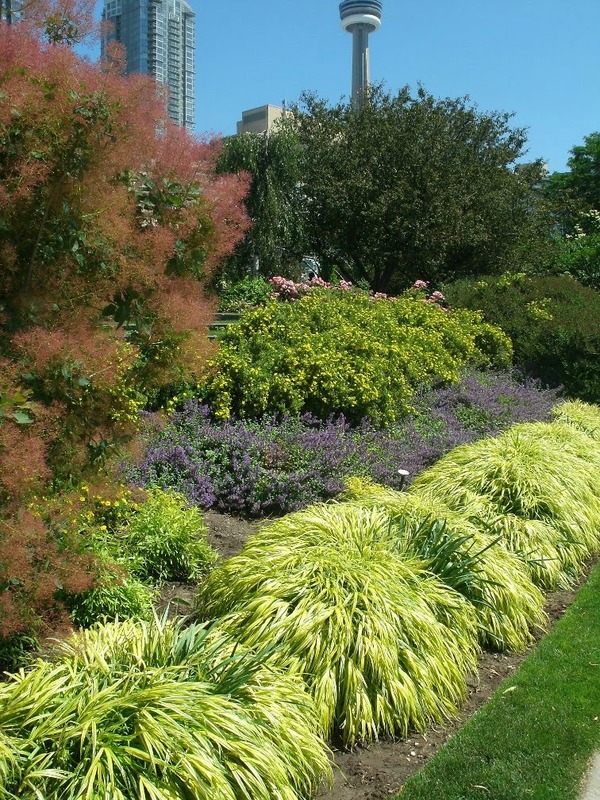 School's out and what's a Toronto gardener to do? The kids finished school and their day camp starts next week so I had to entertain them yesterday. Did I take them to a movie or the mall? They know better! As it was an absolutely beautiful day, I wrangled / bribed / threatened them into accompanying me to a garden we last visited last fall: the Toronto Music Garden. Designed by Julie Moir Messervy , cellist Yo Yo Ma, and others, the three acre space is "a reflection in landscape of Bach's Suite No. 1 in G Major for unaccompanied cello, BWV 1007." There are six sections of the garden which corresponds to each dance movement in Bach's piece: Prelude, Allemande, Courante, Sarabande, Gigue, and Minuets. Here is the link which describes each movement's physical, design, and horticultural components. I think a visitor can have a greater appreciation of the space if she/he actually knows the music driving the design. Since I don't (but should simply add it to my iPod and listen to it during my next visit,) I am more interested in the perennials and woodies used and their placement in the design which equally drive the design. This picture is in the Gigue section but more importantly, to me, shows the design principles of mass, line, and repetition in combination with using complementary colours (yellow and purple) for visual tension and excitement. Yes, you can grow the Japanese Forest Grass (Hakonechloa macra ‘Aureola’) in full sun and doesn't it look smashing containing the Dropmore Blue Catmint (Nepeta x faassenii ‘Dropmore Blue’) and the yellow cinquefoil (Potentilla tridentate) on top? A smokebush in bloom to the left and a crabapple in the background provide more structure throughout the year. Looking eastward, there's an ubiquitous condo to the left and the CN Tower in the middle. To the immediate right is the lakefront, providing conditions which make the visit very pleasant with a prevailing breeze. Lines are always flowing in this space and here's a great example in the Minuet section. The curved metal bench merges into this bed with the Japanese Anemone, a mass of pink astilbe blooming so nicely for us, "Makamik" crabapple, and dwarf lilac in the background. If you like pinks, this area is for you! I hope you can make out the path to the right. It leads down a grove of nannyberry viburnum fronted by a mass planting of "Stella de Oro" daylilies, both in full bloom. To their credit, the kids humored dad for about an hour before making plaintive cries of starvation and neglect. Time for lunch and they led the way up the stone stairs of the gigue. If you're in the Habourfront area, as a local or visitor, try to spend some time at this garden. It's hard to believe that the busy city is so close when you're wandering down the garden's many spiralling paths. Among the many things I adore about it is the realization that there is not one annual used in the plantings so the space is visually interesting (arresting, peaceful) for most, if not all, of the year. Come back in October to confirm this. Its design principles are timeless, like Bach's music. Your kids are good sports! That curved metal bench is so beautiful....it seems to flow like music and fits the space so nicely. the kids lasted longer than I thought, so no complaints here. My wife, who is musical, looked at the pic with the bench and said that the bench sections represents staffs and bars. Looking at some sheet music, she's right!